Welcome to the Birder's Garden! As a single mother wanting to work close to home and be available to my daughters, owning a retail store especially a backyard birding store was never on the radar. Wanting to work for myself limited the possibilities more. Then in 1996 while reading the Wild Bird Center newsletter I found my answer – the local backyard birding store was for sale. With my education, experience and love for nature it was a perfect fit! The store was established as part of the Wild Bird Centers of America franchise when it was opened by Rich & Marsha Held in 1991. The store continued to be operated under the franchise name until 2006 when the franchise agreement expired. With little visible change except for the name and color of the front awning, the store has since continued to operate as an independent establishment. 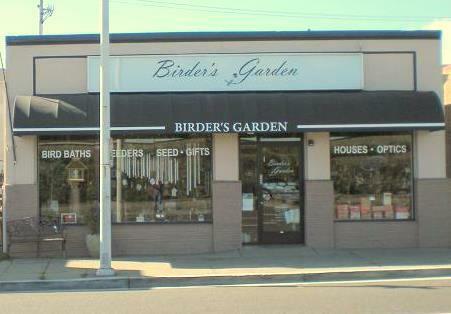 The Birder’s Garden is the Peninsula’s destination store for backyard bird and wildlife lovers and has been for more than 25 years. Specializing in everything needed for successful bird feeding, it fulfills the niche for backyard birding enthusiasts. We offer seed specially selected for the birds of the Bay Area, quality American made feeders, nesting boxes, bird baths, Erva hardware and optics. We also offer clothing, jewelry, books, kids and gift items. Our store is known for its trained staff offering accurate, expert advice and friendly service. Located on the El Camino Real in San Carlos, we are a free standing building next to the Rustic House Restaurant. There is parking in front of the store and behind the store in a parking lot accessible by the alley.